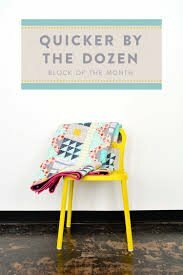 This is an 8 month block of the month (BOM). It is available to START NOW! This BOM features 6 different blocks. You construct 12 of one months block in that month. The 7th month you make the pieced strips, and month 8 you finish. Makes a throw size quilt: 66" x 72"
1.Block kits will be available on the 1st of every month. 2. You must pick up block by the 15th of each month (or we will charge your credit/debit card that day and hold your block until you can come in. 3. We will ship block kits if needed. Shipping is $6.50 per month. We will ship and charge your card between the 1st - 5th of each month. 4. This is an 8 month BOM.You can purchase all kits at one time if you choose, but this option will not be available until July or August. 5. You can purchase backing up front if you wish. If you buy when you sign up you'll get 25% off. If you wait to get backing until the end it will be 15% off. If you want the backing we used for the sample, get it early. We have only a limited quantity.If we are shipping kits to you and you want backing- that will ship along with one of the kits at no extra shipping charge. 6. In this BOM program you will receive the pattern book (with options and yardage list for larger size) and all fabric for the quilt top and binding. 7. We will have some samples of each block ready each month to show you if you come in. 8. Each month the cost is $20.00 (+tax) for the kit. Call or come in to sign up! We have a limited number of kits. Visit shops nationwide and in Canada to collect FREE patterns for a row. You can also purchase kits in the shops design and collectible fabric license plates. 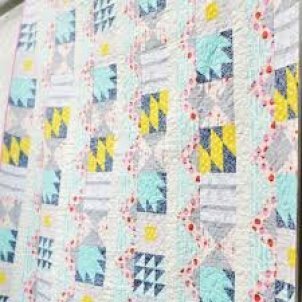 Make a quilt using at least 8 different rows and be the first to turn the completed quilt (quilted, bound, and labeled) in to a participating shop and WIN a bundle of 25 fat 1/4's. If you used that shop's row in your quilt you'll get an extra prize! Limit of 1 FREE pattern per person in the shop. No limit on number of kits you can purchase. Patterns and kits cannot be mailed until November 1, 2017. Only 1 winner per shop. We will sell and mail the fabric license plates anytime (as soon as they arrive here). Call for shipping information. 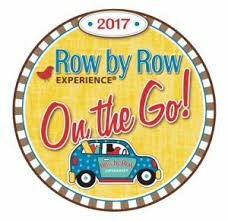 We are ALSO participating in Row by Row Junior this year. 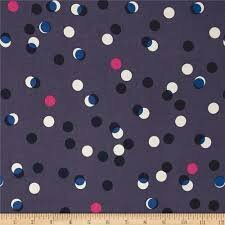 We will feature a FREE Junior pattern to any child who comes into the shop with an adult. We will have a different pattern every 2 weeks. So come often, to get the next pattern. We'll release on facebook which pattern is available! 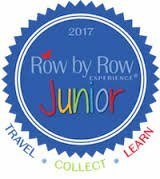 We will also have kits made up for purchase and samples of our Junior Rows made up! Each student will get a FREE sewing kit and supplies for the project. We will make a basic project that will teach straight seam sewing. Enjoy a day of sewing with friends. Create a fun project. 2. If you don't have a sewing machine, we can let you use one free of charge, but these are LIMITED so call early to let us know! Last but not least....SALES in JUNE! Our clearance merchandise is 50% off for the month of JUNE!